The SP 500 is poised to take out its late January, 2018, high of 2872.87. The forward 4-quarter estimate pushed a little higher this week. What continues to impress me is the poor sentiment around the US stock market. The weekly Bespoke Report published every Friday night put out this chart of the US dollar. This chart is the biggest single reason that client’s Emerging Markets weight hasn’t been boosted significantly. If the US and China work out a trade agreement in late August – early September, ’18 over the tariff;s issue, expect the recent “weak yuan – strong dollar” trade to unwind a bit. That being said, clients will still see Emerging Markets bought in small lots, just to buy what isn’t momentum-related. 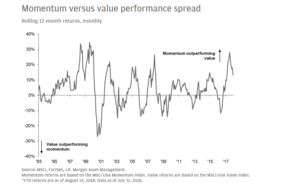 From JP Morgan’s Asset Management missive published Monday, August 20th, this was an excellent perspective on the “growth vs value” dynamic. Client’s have seen some value ETF’s and funds added to their accounts in the last few months, but not to a great degree in terms of account weights. The Russell 1000 Value (IWD) is one, while Schwab’s large-cap value ETF and one of Goldman’s Value funds was bought. JP Morgan’s JVAL is a smart-beta ETF, but the daily volume just isnt there yet. This market is nothing like the late 1990’s either in terms of valuation or sentiment, thus investors shouldn’t fear a “2000 – 2002” type of unwinding in the Nasdaq that was seen almost 20 years ago. That being said styles and sectors can correct through time as well as price. Tech can go out of favor for a while – I thought interest rates might be the catalyst to force a momentum-to-value shift, but waiting for higher interest rates has been like waiting for a tax cut in Chicago or the State of Illinois. Here is a blog post from the late July ’18 looking at the US market and comparing it to the late 1990’s. In retrospect the SP 500 today is wildly boring and still wildly hated today, which is always a good thing.